The Truckee river is filling up right now; accepting all of the snowmelt from the Sierras. When the weather gets warmer the water in the river gets a bit more bearable and is able to be optimized as a natural lazy river. Collect your inner tubes and pack two cars full of people because it’s time to float the river. To successfully execute this activity, you should park an end car at Wingfield Park. Everyone proceeds to pile into one car and drive up the river to Chrissie Caughlin Park. Here is where you enter the river and start floating. If you are wanting more control, float alone. If you want a thrilling and somewhat dangerous ride you should bring some rope and attach all of the inner tubes together. Bring some drinks, and be prepared for a relaxing day floating the river. Tranquility is closer than anyone ever expected. Located directly behind Emerald Bay in South Lake Tahoe is a quick 30-minute hike that uncovers a small and serene body of water known as Eagle Lake. At the beginning of the hike there are moderate sized falls cascading with snowmelt all summer. About halfway through, the hike unveils a breathtaking view of Emerald Bay and Tahoe collectively. Once arriving at the lake there is ample opportunity to swim in the freezing waters, walk across mossy rocks to an opposing side at the mouth of the lake, and hike further back into a quiet area that accepts nothing but contentedness. Bring a book and escape for a while! 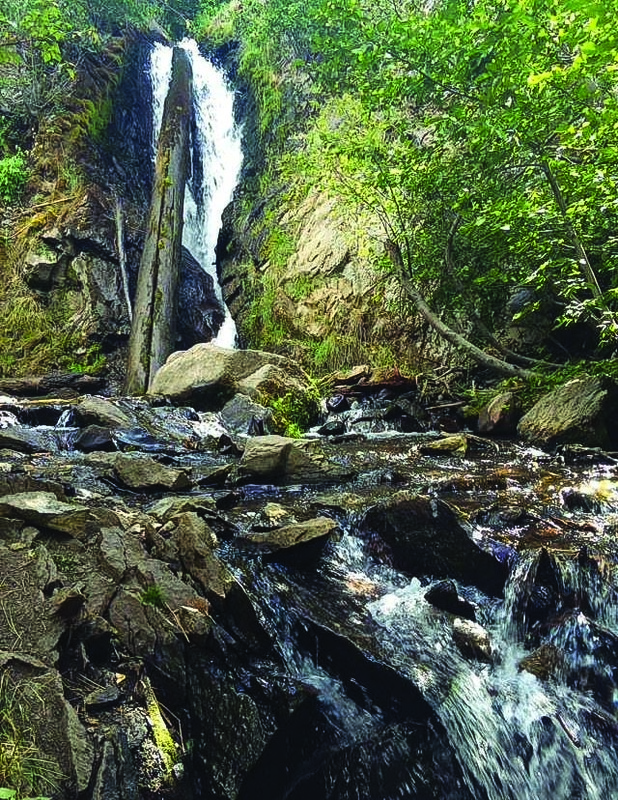 This hike is breathtakingly gorgeous in the summertime and is well worth the drive from Reno. Art in nature is a juxtaposition that claims such a pleasing aesthetic to anyone willing to appreciate its existence. The abandoned Donner Train Tunnels are just this: art in nature. Upon arriving at the Sugar Bowl Ski Resort there are tunnels across the street that span for a few miles within the mountains and contain graffiti art that is so vibrant and strategically placed, displaying collages from numerous artists. The tunnels are technically a hike and during summertime are considered more of a river. The water in the tunnels is ankle deep, but the view of Donner Lake and the personal art that is painted within the walls and on the outer layer of each tunnel is one-hundred percent worth the soaked socks (bring an extra pair of shoes and socks for after the hike). Nature offers a simple taste of adventure at the edge of Northwest Reno stowed behind the beautiful suburbs. This hike is a bit on the long side as it twists and turns around the edges of the hills in Northwest Reno. There is a steady uphill to downhill ratio as the hike unfolds in both directions. At the very beginning, there is a medium sized creek to cross. You can either barrel through and get your shoes soaked, or become a ninja and create a path across the exposed rocks at its lip. Upon arriving at the end of the hike there is a decent sized waterfall that is steadily flowing until all of the snow has melted. The hike will take roughly two and a half hours to complete depending upon the pace that is set. There is not much skill involved with this hike. Hiking it myself, I witnessed all ages coming and going, so invite your friends and family and enjoy a local experience. Grass Lake is a moderate, yet lengthy hike nestled behind Fallen Leaf Lake in South Tahoe. The hike in total will take about three hours and is approximately two miles round trip. Along the hike there are gradual inclines and declines, but there are also pools of water that connect to Grass Lake and funnel into waterfalls along the entire trail. This hike is encompassed by evergreens and a forest floor that flows with water. There are many alternative routes that may have to be utilized during early to mid-summer due to high water levels. Don’t forget to look up when you finally arrive at Grass Lake, there are waterfalls higher than you can imagine, spewing with fresh snowmelt!